These are made of a low allergy, latext free adhesive. 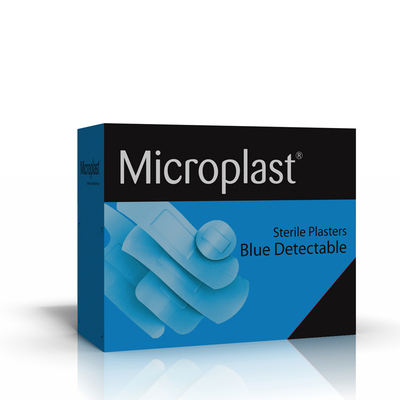 All catering First Aid kits should be fully equipped with our Blue Detectable Plasters. Supplied in a pack of 100, each of these brightly coloured protectors has been made from high-quality materials to ensure they are latex free for a non-irritative application. Offering a variety of sizes to suit all manner of cuts, grazes and injuries, these flexible plasters stick securely around any wound to keep blood in and outside dirt out. With optimal hygiene in mind at all times, each plaster has been individually wrapped to ensure its pristine condition when needed and all 100 come in a sturdy cardboard box which acts as great storage until needed.